Despite recent declines in crypto prices, it seems like the race to capitalize on—or in most cases keep up with—the blockchain revolution has continued on in full throttle. In 2017, startups raised roughly US$ 5.5bn through initial coin offerings (ICOs), with the first half of 2018 already yielding more than double that volume at US$ 13.6bn, according to Coindesk’s ICO tracker. To put it in perspective, that’s roughly 42% and 30% of the US IPO and venture capital markets in 1H18. Countries of all shapes and sizes have responded differently to the crypto craze. Places like Switzerland and Singapore have taken a more progressive approach, having been the first ones to release any sort of definitive regulations supporting crypto. They’re now among the world’s leading ICO hubs. Meanwhile, tiny nations like Gibraltar and Malta have found new claims to fame as blockchain havens, with the latter having successfully wooed the world’s largest crypto exchange Binance to relocate onto their shores. On the opposite end of the spectrum, countries such as China and South Korea have placed an outright ban on all ICOs, putting on the brakes until the proper frameworks to protect investor interests are fully thought out. Taiwan currently lies somewhere in between. While Taiwanese decision makers haven’t necessarily embraced the blockchain hysteria wholeheartedly, they’ve recognized that distributed ledger technology can serve as a huge opportunity for reinvigorating the country’s economic growth and innovative clout, but also that the time to do that is now. Early signs from the tone at the top, as well the strong labor force and growing ecosystem all indicate a promising future for Taiwan’s blockchain industry. As it currently stands, Taiwan’s Financial Supervisory Commission (FSC) has not released any detailed guidance regarding their stance on how cryptocurrencies and ICOs should be treated; they have, however, publicly pledged not to regulate against them. That said, Taiwan’s head honchos don’t plan on simply resting on their laurels either. Recognizing that the industry is evolving much faster than regulators can keep up with and certainly not wanting to miss the boat, government officials have decided instead to establish the Taiwan Crypto Blockchain Self-Regulatory Organization (TCBSRO). Led by “crypto congressman” Jason Hsu, this body essentially comprises of voluntary industry participants that are tasked with setting quality standards and best practices. So far, 50 companies have registered for the TCBSRO, with several dialogues covering pertinent issues such as KYC/AML and data security having already been carried out with the FSC. Even though the guidelines that are put in place are not enforced by law, they will help establish a “code of conduct” or so to speak that will not only help protect the reputation and credibility of good actors, but also set the stage for more fruitful discussions with decision makers later down the line. 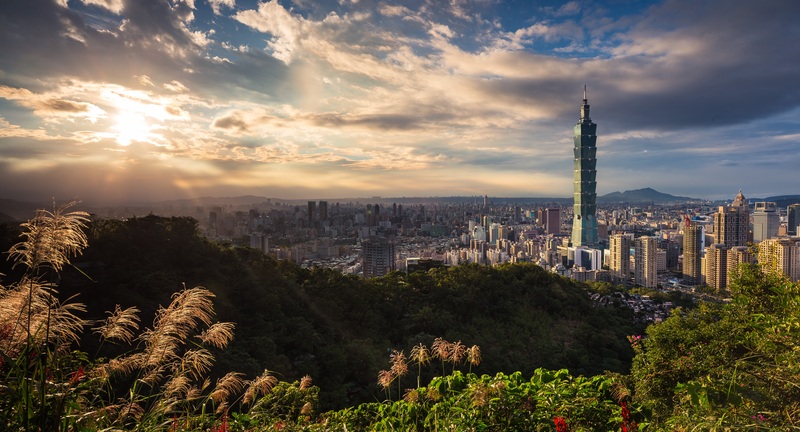 Now, Taiwan hasn’t exactly been known for its loving embrace of new and disruptive technologies, particularly when it comes to financial services. However, the recently enacted Financial Technology Innovations and Experiment Act (aka Sandbox Act) may just help reform that conservative perception. If admitted into fintech sandbox, blockchain and crypto startups, and particularly those looking to conduct ICOs, can operate up to three years without the associated regulatory risks. Regulations are never an exciting topic, but nothing kills the value of an investment faster than legal uncertainty. In Taiwan’s case, the few but resolute steps they’ve taken send a clear message to blockchain startups worldwide: you are welcome here. Although terms like ICOs, tokens, and cryptocurrencies only really started popping up in our daily vernacular in 2017, the developer community in Taiwan has long been rallying behind the idea of blockchain. In fact, out of the Ethereum Foundation’s 20 core developers globally, five are actually Taiwanese and all have actively participated in the Taiwan Ethereum Meetup. The wunderkind creator of Ethereum Vitalik Buterin himself has previously applauded the quality and dedication of Taiwan’s dev culture after one of his few visits to Taipei. Luckily, Taiwan has often been regarded as the region’s hotspot for affordable and high-quality technical talent. Taiwan’s university systems churn out approximately 10,000 computer science grads a year; this is on top of roughly 25,000 annual electrical engineers graduates, truly speaking to the country’s longstanding heritage of semiconductor and hardware manufacturing. This also leaves aspiring innovators in a pivotal position to capitalize on the growing intersection of hardware and software, specifically as it relates to AIoT, smart city, and Industry 4.0—all conceivable applications for blockchain technology. It’s no wonder Amazon, Google, IBM, and Microsoft have all announced plans to establish R&D hubs in Taiwan this year. MaiCoin is one of the country’s first digital asset exchanges supporting fiat-to-crypto trading, now boasting 25,000 active users. This year they launched a full service exchange called MAX. BitoEX is Taiwan’s leading crypto wallet and exchange. Its recent ICO raised US$ 10 million in just five hours, with all 175 million BITO tokens sold to the public in just over 24 hours. Cobinhood is zero-fee cryptocurrency exchange that also offers ICO underwriting services. The team is now in the works of developing a new blockchain capable of “infinite scalability” called DEXON. While crypto has largely hogged the spotlight, it’s important to note that startups in Taiwan have been pushing applications that extend far beyond digital currencies. For example, there’s Bitmark for digital asset registration, OwlTing for food traceability and hotel management, and Mithril for decentralized social media. Early signs of adoption have also started to resonate among some of Taiwan’s age-old institutions. Earlier this year, Fubon Commercial Bank launched a blockchain-powered payments system for retail usage, a first in the country, while Taipei City Government announced its partnership with IOTA to create citizen ID cards built on the foundation’s proprietary Tangle technology. On the media side, large-scale conferences have done a phenomenal job of highlighting Taiwan’s budding blockchain prowess. The 2018 Asia Blockchain Summit this past July attracted over 2,500 attendees spanning blockchain startups, investors, and opinion leaders from around the world, including the likes of Litecoin founder Charlie Lee and Binance founder Changpeng “CZ” Zhao. Even here at AppWorks we’re starting to feel a surging movement. We weren’t really sure what to expect when repositioning our accelerator to focus exclusively on AI & blockchain this year. That said, we were pleasantly surprised by the outcome. Out of the 33 startups that joined our latest batch (AW#17), 13 are working with blockchain, with over half of them hailing from countries outside of Taiwan including the US, Sweden, Austria, Poland, Vietnam, South Africa, Malaysia, and Hong Kong. Some might wonder what sort of business founders have in flying all the way over to Taiwan to build their startups. Well, simply put? Because they can. That’s the beauty of blockchain. It’s a market that knows no geographic bounds. It completely democratized the global spotlight and gave a voice to those countries traditionally overlooked for their size and scale. Now, countries like Taiwan are finding new strides by embracing a technology that others have turned away. 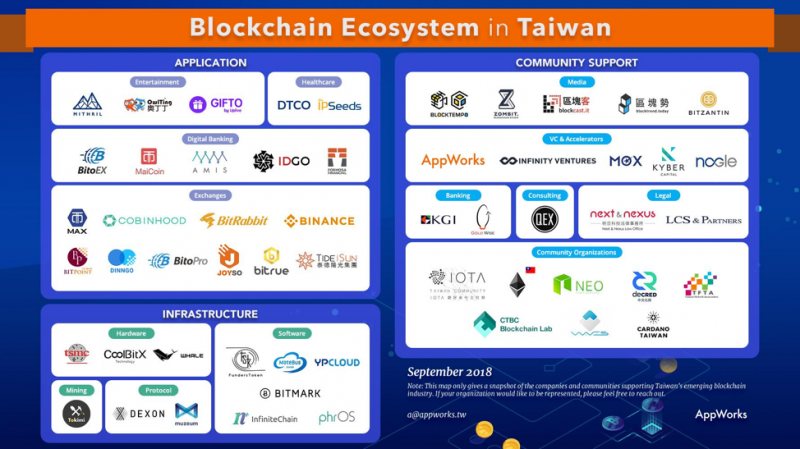 This alone will likely leave the island nation in a prime position to build a critical mass of talent, capital, and companies for Taiwan’s blockchain industry to truly thrive moving forward. If you’re a startup currently or prospectively employing Blockchain, be sure to apply to AW#18—AppWorks Accelerator’s AI & Blockchain only batch. Early Mover Round deadline for applications is Oct-29, 2018.